There are very few things better than sitting outside, in gorgeous weather, with good friends, good food and good wine. Really, there just aren't that many things that make the world more enjoyable. So when Hood contacted me about hosting a summer garden party, focusing on their awesome new Cottage Cheese flavors, I immediately accepted. Earlier this year, Hood released their delicious, creamy, high protein and nutrient rich Cottage Cheese in new flavors of Garden Veggie and Cucumber Dill. These are classic flavors, but here, they are deliciously done and perfect for making all sorts of brand new creations. Now when I'm creating a party menu, I love to make finger foods- items that are easy to eat, easy to mingle with, ones that are small bites but full of flavor and textures. the cucumber dill. For whatever reason, whenever I think of this combination of flavors, I immediately think of something spicy to contrast the cooling nature of the cucumber, and even more so the dairy that was present here with the Cottage Cheese. 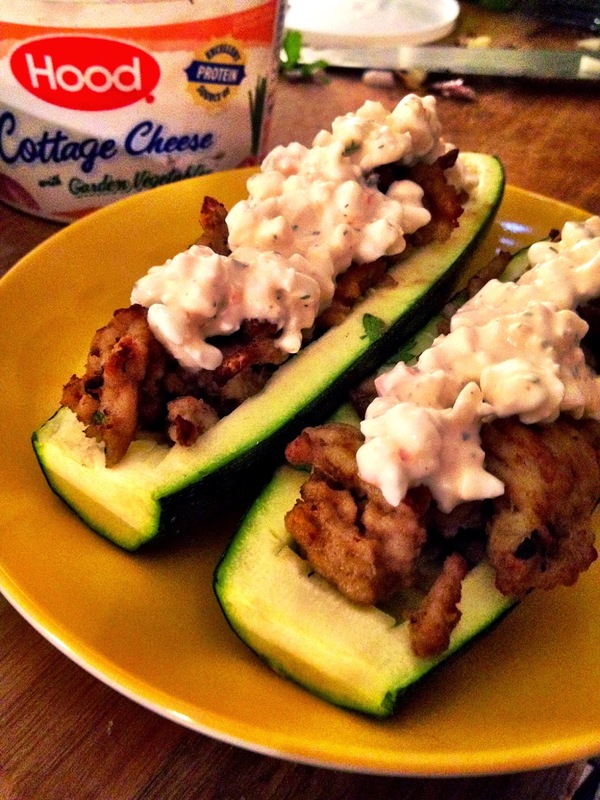 I decided on spicy chicken, set in convenient boats made out of endive and topped with the Cucumber Dill Cottage Cheese. Simple to make, and perfectly easy to eat the endive creates a satisfying crunch with just a bit of refreshing water to cool the heat from the chicken, and then further with the cottage cheese. Paired with a glass of slightly sweet Riesling, or a nice, acidic Sauvignon Blanc- these bites were both filling and light. Next I concentrated on the Garden Veggie. I'll be honest, I was anticipating rather flat flavors from this variety- the delicacy of vegetable flavors overcome by the dairy. However, instead it is full of real flavors- peppers, herbs, zucchini...and somewhere just a little bit of a kick of spice. The flavors in the cheese demanded being the star of the show, so I made two simple recipes with them. The first was a similar "boat" experience as the endive, but instead here I decided hollow out the insides of a few small zucchini, and then fill it with sauteed ground turkey breast, and topped it with the cottage cheese. Minimizing the seasoning here on the turkey meat allowed the cottage cheese to take center stage and the delicate flavors within to come into their own. The flavors here are so rich and powerful, I loved pairing this with a full bodied glass of Grenache based Rose. with maximum deliciousness. Hollow out just a couple of cherry tomatoes, fill the center with Garden Vegetable Cottage Cheese, and here is where I differed the recipe- top with freshly fried pieces of bacon. Yup- I went there. I found all of the flavors to be highly adaptable and easy to work with. Each contributes its own unique flavors- flavors that are fresh, natural, and completely delicious. 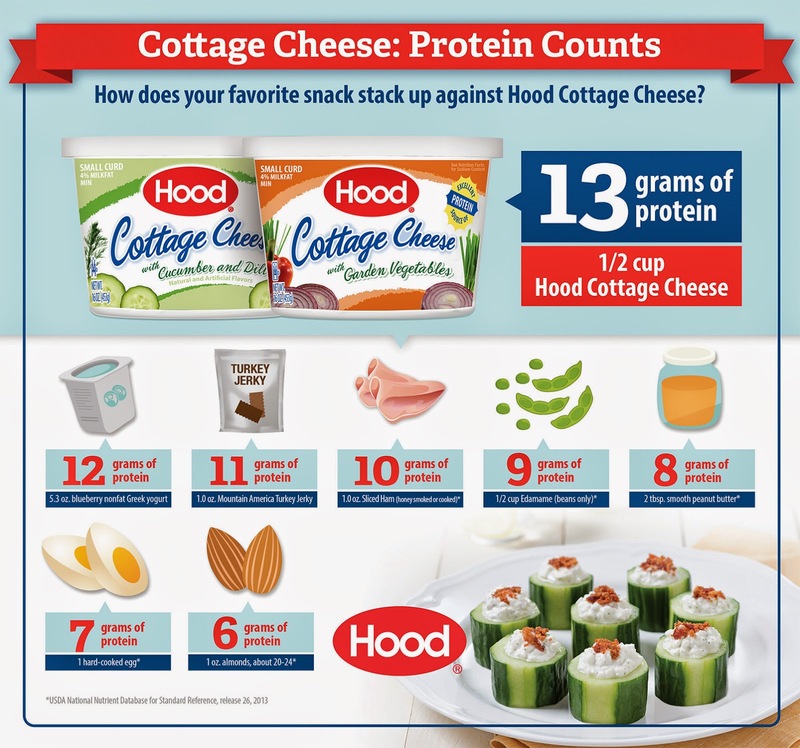 Hood Cottage Cheese is full of awesome nutrients and is a fantastic addition to a balanced diet. Pre Heat oven to 375. Blend together the cayenne pepper, garlic powder, black pepper and salt and rub into the chicken breasts. Bake until done, then dice the chicken. Distribute the chicken between the endive leaves and top with the cottage cheese. Pre Heat the oven to 300. In a small pan over medium heat, add the olive oil, and saute the onions, and then add the ground turkey, salt and pepper. While that cooks, slice the zucchini in half lengthwise, and then, with a small, sharp knife score the inside into small pieces being careful not to cut all the way through the skin. Remove the pieces, leaving the space to fill with the turkey meat. Add the pieces to the sautee pan with the turkey meat. When the turkey is done cooking, shovel the mixture into the cavities in the zucchini, top with cottage cheese and serve!